Home Our Garage Door Services Garage Door Openers What’s The Best Type of Garage Door Opener for Me? 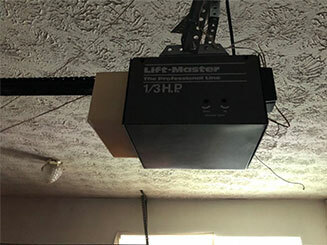 There are dozens of different types of garage door opener models on the market today, from many different manufacturers. If you’re looking to upgrade your existing unit, it can be hard to know which one is right for you. The biggest difference between the various models are the drive systems they use. This guide outlines how each one works and what they’re ideal for. Our experienced technicians can provide in-depth guidance on many different opener models, so feel free to get in touch with us if you’re considering investing in a new unit. The most widespread type of drive system is the chain drive. These openers use a long metal chain, similar to a bicycle chain, to drive your door up and down. They’re robust and reliable, and are the most affordable of all the drive types. However, they have one major drawback - they’re very noisy. The clatter and clanking of a chain drive is seen by some as a bonus, since it provides an audible warning that the door is moving; however, many homeowners prefer quieter options. An alternative to the chain drive that many homeowners are turning to is screw drive opener models. Instead of a long metal chain, these units use a threaded metal rod to push and pull the door up and down. Because there’s less slack in the system, this results in a much smoother operation, and it also requires a lot less maintenance. They’re a great all-round option, but they do cost more than typical chain drive systems, and aren't that quieter. Sometimes described as the “Cadillac of garage door openers”, these units replace the standard metal chain with a rubber or fiberglass belt. This results in a far smoother and virtually silent operation, and is essential for garages that sit underneath or adjacent to a bedroom. Systems equipped with this type of opener can work extremely quietly. However, belt drive units also tend to be more expensive than their counterparts, so budget conscious owners may opt for a different choice. Knowing what each drive type is good for is a great first step, but there’s still a lot to learn. If you need a little extra assistance, get in contact with our team today - we’re always happy to help.